Last November, as some of you might remember, I participated in NaNoWriMo, or National Novel Writing Month. I wrote a 50,000 word book in a month. I loved doing it. It was stressful, intense, exhilarating and had me throughly insconced in the world of Pumpkin Spice Lattes. At the end, I had not only written a book which I hope to one day publish, but I had also closed a long chapter in my life by writing the story (albeit completely twisted and fictionalized) down on paper. I contemplated doing NaNoWriMo again this year, but it had me completely cut off from my friends for 30 days, and I don't think now is the right time to do that as they have not been happy with me for some time. If I disappeared for another 30 days, I might very well lose some friends. So in lou of doing NanoWriMo, another challenge has been proposed. NaBloPoMo, or National Blog Posting Month is beginning on November 1st, and I am going to take part. It is no where near as time consuming or ultimately fulfilling as writing a book in a month, but it is a small goal to work towards, and may be as enjoyable for you, my readers, as it is for me. 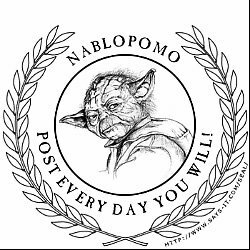 The goal of NaBloPoMo is to post something to my blog every single day in the Month of November. Even Saturdays and Sundays!! Now here is where I ask you all to delurk (which means, "stop just reading, and start commenting" to those of you who are non-bloggers). I would love to hear what you all think I should write about. I have some ideas of my own, but I want to know what you all like reading from me. Posts about my life? My cats? Reviews or rants about products? Politics? Maybe more detail about the photographs I take? I have a million recipes...I could post those...Or something I haven't listed here? What do you want to read for the next 30 posts? I want to make sure you are here a lot in the next few weeks, so I had better know what material will get you here! Leave your ideas in the comments, please, and wish me luck! If you like being crafty, this blog is for you. Not Martha is awesome...she can make just about anything, and gives handy dandy little tutorials. Her latest creation may be my favorite though. These are friggin' AWESOME! 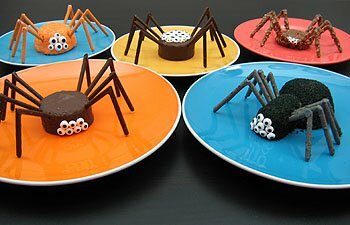 I don't even LIKE snack cakes and I want to make these!